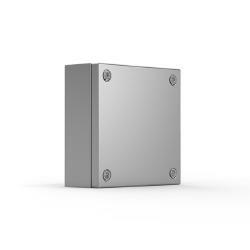 The stainless steel terminal box range, SSTB, with a IP 66 protection degree, is available off the shelf in many different sizes. The SSTB range is well suited for indoor and outdoor environments thanks to its corrosion resistance. Water and dust are prevented from entering the terminal box, thus eliminating the risk for component failure, and with that, unnecessary downtime. AISI 304 pre-grained stainless steel / AISI 316L (on request). Body: 1 mm. Cover: 1.5 mm. Folded and seam welded. Four M6x13 studs for bottom profile / mounting plate fixation. For AISI 316L, sealing is ensured by an injected one piece silicone gasket. Body, cover, cover screws, fixing screws, cover plugs and earthing facilities.